Kotaku 'Shop Contest: A New Challenger Appears, Winners! Image editing brings the best out in everyone, and we’ve had some truly amazing entries centered on bringing different characters together so that they can, well, fight each other. Last week I asked you to put some new fighters in the arena together, and I was not disappointed. There were so many good ‘shops that they definitely won’t all fit in this post, so I encourage you to go look at all of the entries in the comments for the topic announcement post. The winner this week is sciteach. 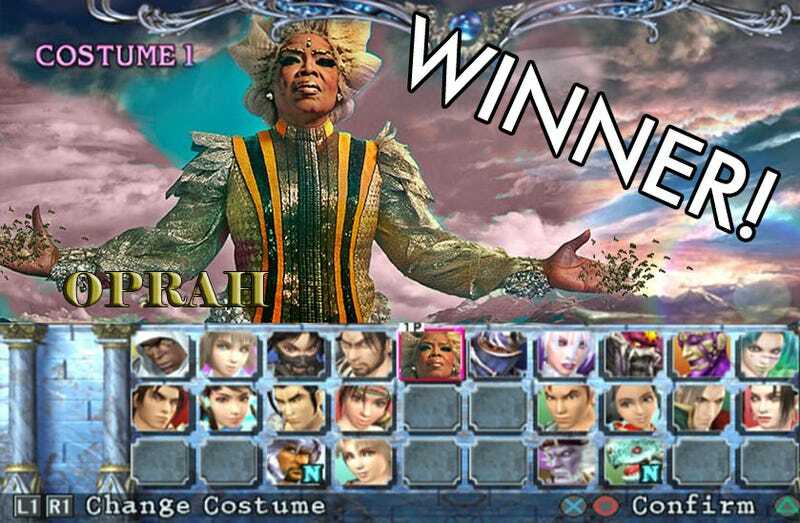 It’s a well-known fact that Oprah is a brawler, and her appearance as some kind of space wizard in A Wrinkle In Time has only solidified her within the canon of bee-summoning fighting game characters. Bunnyfish reimagined The Handmaid’s Tale, a tragic story of women being crushed beneath a fundamentalist regime, as a more literal kind of fight. cecil_banon went deep with Baldur’s Gate, the ultimate fighting game. ChefRobertIrvine delivered the game that I was denied in my childhood. There’s nothing more rage-inducing than my inability to perform a perfect moonwalk. cinerius brought Majima to the party. Ginkaku points out that sometimes all the street needs is one punch to make it right. Governor_Explosion reimagines many different games as some kind of omnibus fighting game. Majima is there (of course). lildobber pits two lumpy fighters against each other. There can be only one. raftos sent one warrior back in time to destroy the Dragon Balls before they were ever created.